2008: A packed church and overflow tent witnessed the induction of a new pastor, who has just retired from the RAF, to South Park Evangelical Church in Norwich. Stuart Bailey, who has just retired as an RAF serviceman, has also been studying Bible college courses for several years. Family and friends from various parts of the country, and guests from local churches and the South Park neighbourhood swelled the regular congregation. The church was filled to capacity and so the service was relayed to more people who were accommodated in a marquee set up alongside the main church building for the purpose. Stuart together with his wife and daughter have now moved to live near the church, so they can be part of the community with which South Park Church is involved and with whom they seek to share the Christian faith. Pastor Tom Chapman of Surrey Chapel, Norwich, where Stuart and his family formerly worked and worshipped, took part in the induction service, which was led by Dr Rodney Moss. The encouraging sermon was preached by Rev Jackie Brown of Bridgnorth, a friend of Stuart’s from the years when he was based at RAF Cosford. After the service a buffet tea was provided for all who attended. 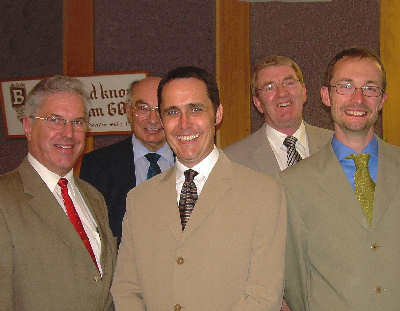 Pictured above are, left to right: Dr Rodney Moss, Nigel Barber, Pastor Stuart Bailey, Reverend Jackie Brown, Pastor Tom Chapman.